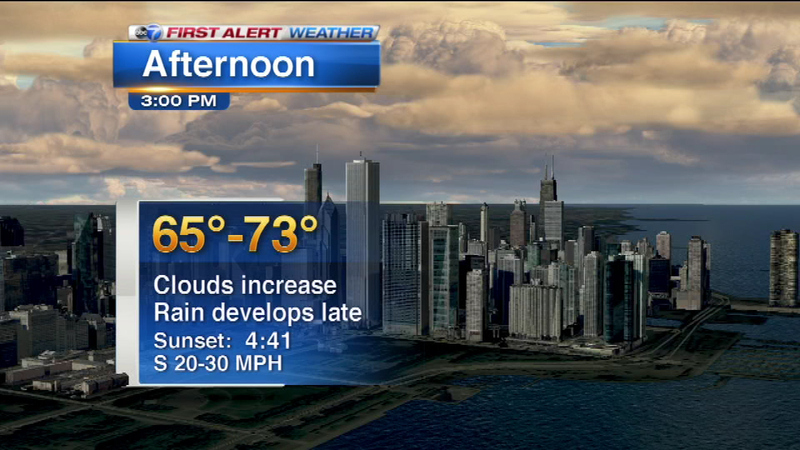 Chicago Weather: Watch out for falling temps! CHICAGO (WLS) -- Get outside now! Or you'll soon regret it. Chicago weather is about to make a drastic change; the warm snap is drawing to a close. Temperatures will once again hit 70-degrees on Thursday, but they'll drop- almost 20 degrees- shortly thereafter. Around 8 p.m., precipitation moves into the Chicago area. Rain and temperatures will fall overnight and into early Friday morning. Some thunderstorms are possible, too, around midnight. They could produce some gusty winds, ABC7 Meteorologist Tracy Butler said. Click Here to track the rain on Interactive Doppler Radar. While the rain ends Friday, the cold spell sticks around through the weekend. Friday will be much cooler, but closer to the average high with 54-degrees. Frost is expected this weekend.